Lytham Club Day had seemed a long way off when the idea of attending with 509 was first suggested but before we knew it, it was just a couple of weeks away and there were all kinds of official questions being asked of us. Becky, as always, fielded many of them and got them sorted out in no time at all. Once again we decided to call upon our friends to help with looking after 509 and supplying a few vehicles. Mark and Judith were going to come over in the afternoon along with an M38 jeep owner who missed out last time when we were at Lytham Hall. Sandy Mercer valiantly offered to help us as the receiving team on Lytham Green. 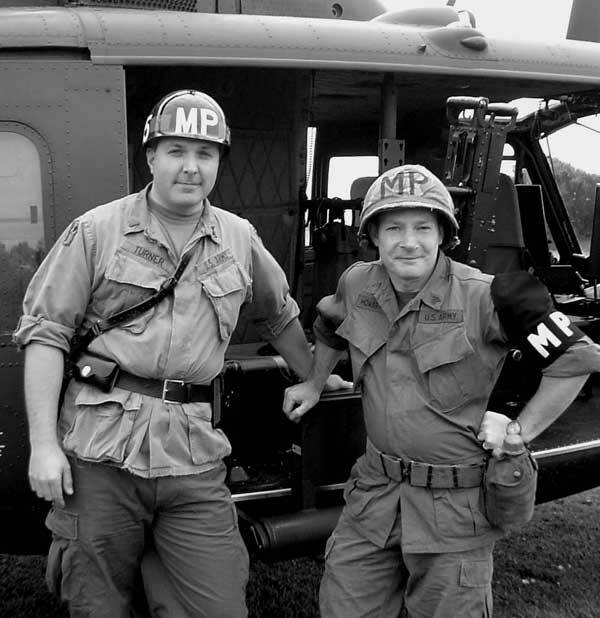 So with myself, Phil, Bradley, Jo, Nina, Becky and Tony we had our Huey Team for the day. The flight team for this event were Phil and Bradley as the GIF's (guys in front) and Jo and Nina as the GIB's. Phil and Bradley set off for the airport almost immediately after we had arrived and got the jeep fired up. Jo and Nina followed them on a little later. I set off for Lytham Green in the jeep piled high with chairs, etc that we would need on the ground. The wind was to say the least brisk but not too strong to prevent 509 from coming in. Sandy had already arrived so we set about putting the railings out provided by the council to cordon off the area we needed to bring the Huey in. Whilst we were doing that Becky and Tony arrived, so the rest of the barriers were set up in no time at all. We were expecting 509 to fly in around 9 to 9:30 am. It can't be a precise operation because at the Airport there are many outside influences that we have no control over. 9:30 a.m. came and went and still no sign of 509. I was listening into the Air Traffic at Blackpool Airport had heard that there was a stubborn seagull on the runway! The bird scarer was called for and all anyone could do was wait for this seagull to take flight and clear the way for normal services to be resumed! It seemed an absolute age before we heard the good news that the bird had been scared off but still not a squeak from Phil on the radio talking to Blackpool Airport Air Traffic Control. Time was pushing on really as the Lytham Club Day Parade was due to start at 10.00 a.m. At 9:40 a.m. I got a call from Phil to say they would be lifting in around 10 minutes. That still gave them easily enough time to land before 10 o'clock. Within a few minutes the phone rang again to say that there was a problem with the headsets in the helicopter. There was a fault with one of the helmets so I gave them a pointer of what to look for as we had had a similar fault before with one of the headset extension leads. Time was now getting tight. A few minutes after that we heard the distinctive sound of 509 beating the air. The sound she was making was drifting in the air from Blackpool Airport . I heard on the radio Neil Airey , who was on duty that day with the North West Air Ambulance, making a reference to the Huey so I knew 509 must be on her way. 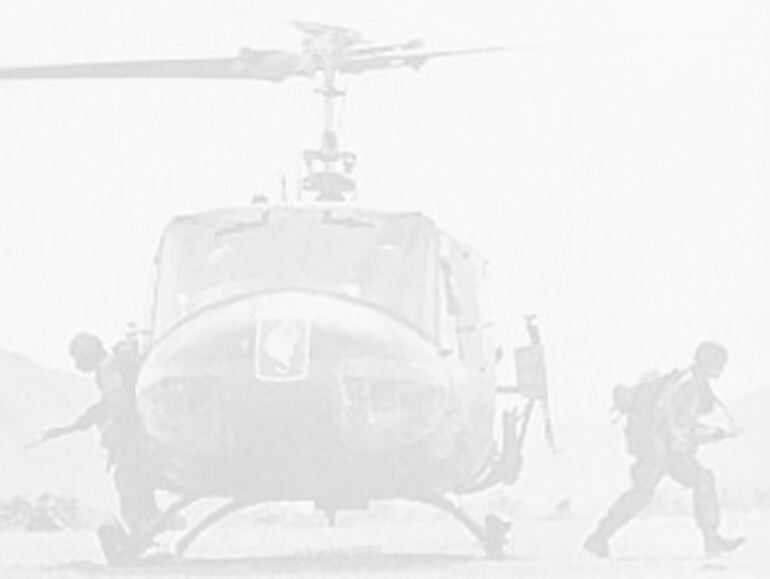 Sure enough the distinctive rotor beat got louder and louder and Phil's voice came over on the radio saying 509 two minutes to landing. With that Becky, Tony and Sandy moved to the perimeter fence to make sure no-one entered the safe zone including footballs, frizzbies and dogs alike! I moved in to the middle with my back to the quite strong wind as a reference, though the flags nearby left no doubt in anyone's mind as to which way the wind was blowing. 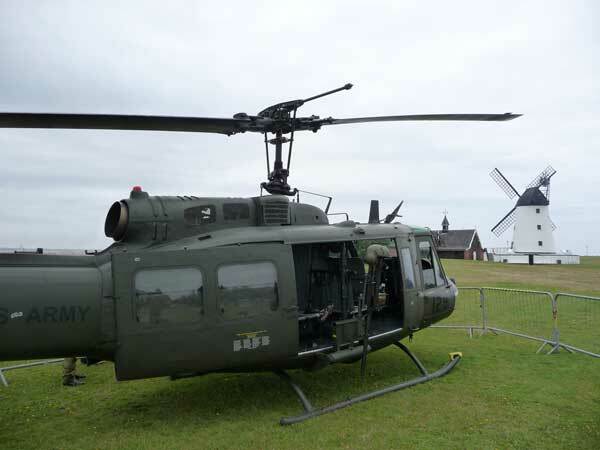 Phil flew the Huey straight down past the Windmill and turned in land to fly straight back up towards me and the strong wind so he could land nose in to wind. His approach was spot on and with guidance from me I had him on the ground just where we wanted 509. The rotors wound down and they were secured. Quite a crowd had gathered to see 509 come in and started to move towards the machine so we repositioned the railings to keep them at a safe distance. All the while we could hear the bands in the parade warming up just a few streets away. Phil's timing had turned out quite well, though fortunately the start of the parade was slightly later than planned which had given us a wider window to get 509 on the ground. 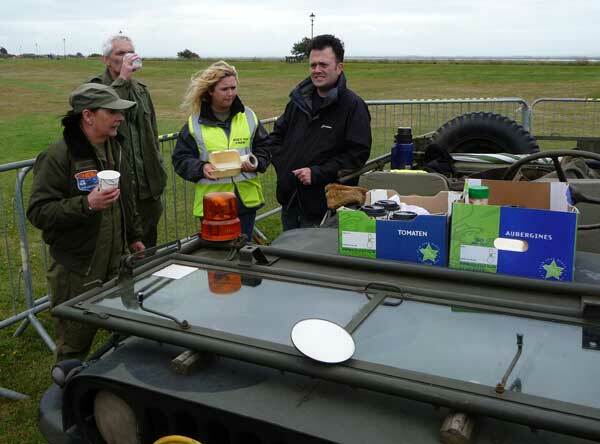 With the fence around us, the Club Day Organisers had arranged for bacon butties to arrive along with coffee (and sandwiches for lunch) – “Thank You Francis!” - we enjoyed our grandstand view of the floats coming down the coast road. The highly decorated floats and vehicles in the parade just kept coming and coming. It was an hour before the Fire Engines came in sight which marked the end of the parade. 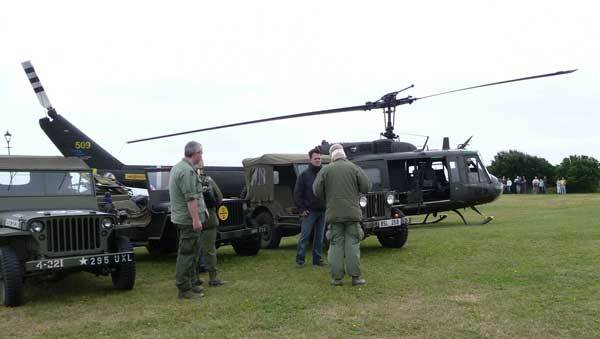 From there on in there was a steady flow of visitors coming to have a look at the Huey and the jeep. Shortly after the parade had finished and the road re-opened Mark and Judith arrived in their jeep along with Mark from Leeds in his M38. These two jeeps were put driven into position behind the barriers. We now had a strong team to talk to those that had ventured over in the still strong wind to come and have a look. One or two familiar faces appeared to say hello and have a chat. We were becoming a little concerned as the afternoon wore on as the wind strength was increasing. With this uppermost in our minds we started to prepare 509 for departure. Battery power level was checked and the rotors untied. The fencing barriers were moved to a safe distance and the ground crew spread out to make sure everyone was kept out of harms way. Quite a crowd had gathered to watch Huey depart. A number of people who had visited earlier had asked what approximate time she would depart and had returned in good time so as not to miss the experience! The crew were briefed and strapped in. Phil was flying and I was in the left hand seat for the flight back to Wesham. Pre-flight checks completed and the starter switch was pressed; Phil kept his eye on the power output and exhaust temperature etc. The massive blades started turn and the Huey started to rock as they picked up speed. Oil pressures rose, generators were producing power and the critical 40% of power was reached for the turbine to be able to take over from the starter motor to take the blades up to speed. 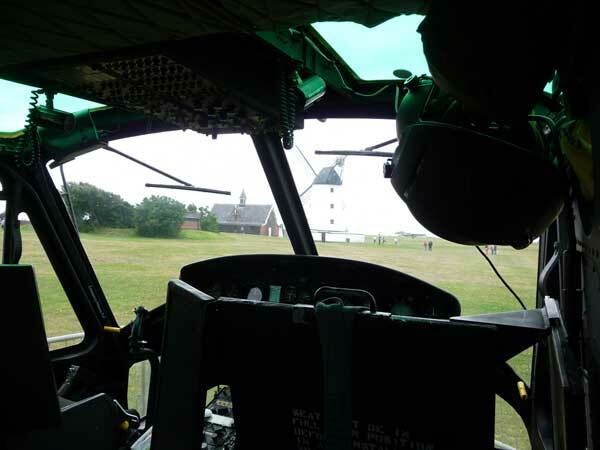 Once again checks were made that the Huey was responding in the way she should, a call was put into the ATC at Blackpool and we were good to fly. With the strong headwind 509 effortlessly lifted into to the sky just before 3:30 pm. Happy that he had plenty of height to clear the obstacles to our left, Phil took her sideways out to the mud flats before nosing her over to take us into transitional lift flying out to sea. Once he had gained enough altitude he banked her over to the left and turned her round to fly back to Wesham heading up the Estuary. We watched as the familiar sights passed below. No sooner had we completed our checks after take off and for cruising we were doing our pre landing checks. Six minutes after taking off from Lytham Green Phil put 509 down in the back field and we went through the shut down sequence. Everything was unloaded and the machine secured for the night. Whilst we were doing that, the Ground Crew at Lytham Green gathered up the fencing and loaded the rest of the gear into the vehicles before heading home. A very enjoyable day was had by all. 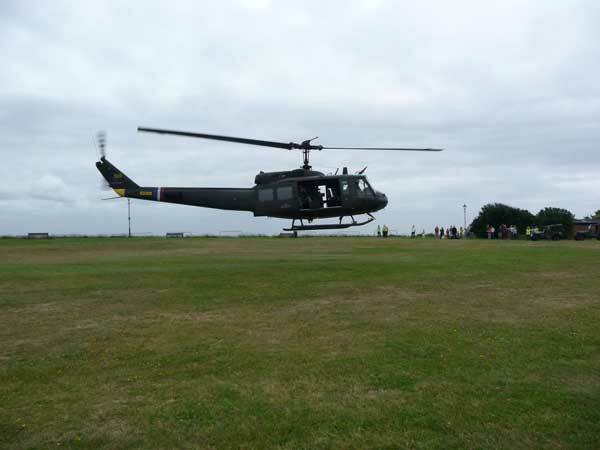 Our thanks to the Lytham Club Day Committee for looking after us so well and of course to the Huey Crew for the day without whose help we wouldn't be able to do what we do.